Ambassador Girma Birru, Special Envoy and Ambassador Extra-ordinary and Plenipotentiary of Ethiopia to the US, who is currently the co-chair of the AGOA Ambassadors' Working Group in Washington DC, testified yesterday on issues relating to the reauthorization of African Growth and Opportunity Act (AGOA) and shared his perspective before the United States International Trade Commission which is conducting various investigations on the topic. Ambassador Girma Birru, the co-chair of the AGOA Ambassadors' Group in Washington D.C. appreciated the opportunity to express his views speaking on behalf of the African AGOA Ambassadors' Group and underscored that AGOA remains the central pillar of US-Africa trade and economic cooperation. �"AGOA embodies our joint aspiration that sub-Saharan African (SSA) countries become a full-fledged member of the global economy", he added. �Ambassador Girma recalled that the authors of the Act had envisaged that AGOA could create a meaningful opportunity for beneficiary countries in Sub-Saharan Africa to fundamentally change the structure of their economies. The expectation was that AGOA would become a catalyst for economic growth and free markets by way of providing market access to qualifying SSA countries over and above helping accelerate Africa�s integration to global markets through trade and investment, the Ethiopian Special Envoy underscored. The co-chair of the AGOA Ambassadors' Group reiterated his belief that AGOA has made a significant impact on exports of SSA countries and has helped to generate jobs in both Africa and the US. Speaking about the hurdles faced in the effective utilization of the opportunity AGOA offers, the Ethiopian Envoy cited that very few countries made use of the "opportunity due to supply side constraints, mostly having to do with the lack of infrastructural and institutional capacities". �Ambassador Girma stressed that the SSA countries have recognized that they need to address the supply-side constraints which have hindered the effective utilization of AGOA by developing a coordinated and strategic response at the national level. "Upon the decision of our Ministers of Trade that each AGOA eligible country should develop its own national AGOA response strategy, many countries have begun to work on their own national strategies to ensure that the AGOA opportunity is better utilized��� based on the realization that mere reauthorization is not going to lead to any dramatic results unless beneficiary countries change the way they do business" the Ambassador Extra-ordinary and Plenipotentiary reminisced. ��������� The co-chair of the AGOA Ambassadors' Working Group in Washington DC, finally reiterated his belief by strongly underlining that "AGOA and what it stands for is fully ahead of us. Through AGOA he continued "we have been able to lay a strong foundation for the strategic US-Africa partnership over the last decade. 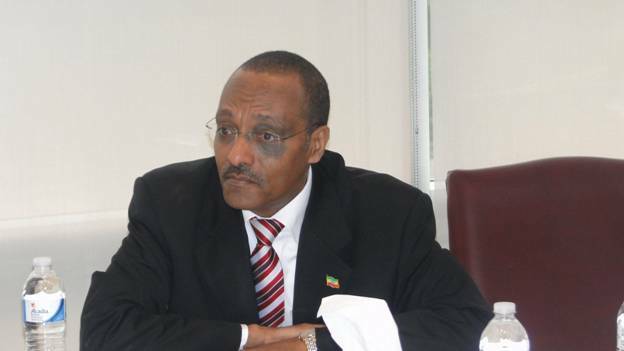 Though it took some time, �projecting his belief the� Ethiopian Ambassador to the US said that African businessmen and women have now began to understand the US market better and are planning for the long run. He added that US Businesses are also increasingly looking towards Africa more than any time in the past. By way of concluding his testimonial Ambassador Girma Birru succinctly argued by underscoring his belief that if Africa can sustain its economic momentum of the last decade, it is very likely that it can follow on the footstep of successful Asian countries. Therefore, he added if AGOA is to play its primary objective of helping African countries achieve sustainable economic transformation, AGOA should be extended for a period of 15 years. The Third Country Fabric provision should also be made inseparable from the lifespan of the reauthorized AGOA. We are asking for the reauthorization of AGOA on the basis of a partnership and in the hope that the very goals set for AGOA from the outset will be achieved, he emphasized. Other AGOA eligible countries Embassies' witnesses during the public hearing session were Somduth Soborun, co-chair of the AGOA Ambassadors' Working Group in Washington DC and Ambassador of the Republic of Mauritius, Ebrahim Rasool, Ambassador of the Republic of South Africa, and Ambassador Jean Kamau, Charge D' Affaires of the Republic of Kenya. Witnesses drawn from the Common Market of Eastern and South Africa, New Markets Lab, Washington D.C, Manchester Trade Limited, D.C., Progressive Economy, D.C, African Business Initiative, US Chamber of Commerce, D.C, National Foreign Trade Council, Inc, D.C, Coalition of Services Industries D.C, Covington and Burling LLP, D.C, African Coalition for Trade Inc. D.C, African Cotton and Textile Industries Federation, Nairobi Kenya, American Apparel and Footwear Association Arlington, Virginia, National Chicken Council D.C, �USA Poultry and Egg Export Council, D.C, California Clean Peach Board, California Canning Peach Association and American Sugar Alliance D.C, have also shared and presented their respective views and positions on the matter. The Ambassadors' Group has been able to develop a coordinated and common position on the reauthorization of AGOA which has been accepted by African Ministers of Trade. The AGOA Ambassadors' Group is made up of Ambassadors of AGOA eligible countries and is primarily interested to engage with the US Administration and Congress to promote the US-Africa partnership in the context of AGOA for mutual benefit.